Of course, Alexander never ‘chased the Persians’ out of anywhere. What he did do – as Ahmed says – was overthrow the Persian Empire. There are a number of dates which may be counted as the point when it fell (For example, October 331 following the Battle of Gaugamela or later that same month upon Alexander’s entry into Babylon) but if we take – what I propose to be – the latest one: the death of Darius III in July 330 B.C. then that would mean Alexander ‘put an end’ to the Persian Empire when he was just 26 years old. Perhaps Ahmed, despite his obvious disapproval for the leaders of Iran, didn’t want them to feel too bad. 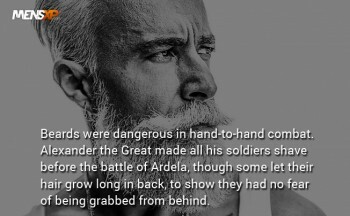 Leaving aside the fact that the Battle of Arbela has been spelt incorrectly, there is nothing in the five principle sources for Alexander’s life to back up the claim that he made his men shave or that they grew their hair long at the back. The quotation may be rubbish but it hasn’t been made up by the writer of this article. A bishop of the late fourth/early fifth century, St Synesius, referred to it in a playful work titled A Eulugy of Baldness. In it, he claims that Alexander made his men shave before the Battle of Gaugamela and gives Ptolemy I as his source. You can read more here. I strongly suspect Ptolemy or Synesius or someone in between was pulling his reader’s leg; unfortunately, this has been forgotten leading to the picture above. Forbes magazine isn’t the place one would normally expect to see a piece of fan-fiction in, but yet, at the start of an article on the American health care system, there it is – a short story starring Alexander at the tomb of Achilles. At the heart of the narrative is Alexander’s recognition that nothing lasts, that all things fail. I am open to correction on this, but in reality, I believe Alexander spent precisely zero time worrying about the future. He was too busy winning fame in the present. Money Management reports on the semi-retirement of ‘TAL chief executive and ardent All Blacks supporter, Jim Minto’ here. Reflecting upon the good which life insurance delivers to people, Minto ascribed to Alexander the Great final words to the effect that the good deeds people do are remembered long after the people themselves. However in this age of Google, interwebs, etc those at the media table quickly came to the view that notwithstanding Minto’s laudable sentiments, Alexander the Great’s final words were claimed by most experts to have been “I wish people to know that I came empty handed into this world and empty handed I go out of this world”. I have absolutely no desire to cast aspersions on the quality of Money Management‘s journalism, but if the website had actually spoken to any expert on Alexander the Great it would have discovered that he did not say any such thing. Upon receiving the call from this journal, the expert would have opened up his copy of Arrian up and said ‘Arrian gives three different possibilities for Alexander’s last words. ‘The first, which comes from Ptolemy and Aristobulos, is that he – Alexander – did not speak at his death as he had lost the use of his voice a day or so earlier (vide Arrian VII.26). ‘The second – which comes from unnamed writers – is that, after being asked to name his successor, Alexander said he left his empire to ‘the best man’ (Arrian VII.27). ‘The third – again, from unnamed writers – is that ‘… he went on to say that he knew very well there would be funeral ‘games’ in good earnest after he was dead’ (Ibid). [Alexander] bade his friends draw near since, by now, even his voice had started to fail, and then took his ring from his finger, and handed it to Perdiccas. He also gave instructions that they should have his body transported to Hammon. When they asked him to whom he bequeathed his kingdom, he answered, ‘To the best man,’ but added that he could already foresee great funeral games for himself provided by that issue. When Perdiccas further asked when he wished divine honours paid to him, he said he wanted them when they themselves were happy. These were Alexander’s last words; he died moments later. When [Alexander], at length, despaired of life, he took off his ring and handed it to Perdiccas. His Friends asked: “To whom do you leave the kingdom?” and he replied: “To the strongest.” He added, and these were his last words, that all of his leading Friends would stage a vast contest in honour of his funeral. Finally, Justin. ‘He has Alexander say a few things’ our expert would have said. On the fourth day, Alexander, finding that death was inevitable, observed that “he perceived the approach of the fate of his family, for the most of the Aeacidae had died under thirty years of age.”… he asked his friends that stood about him, “whether they thought they should find a king like him?” All continuing silent, he said that, “although he did not know that, he knew, and could foretel[l], and almost saw with his eyes, how much blood Macedonia would shed in the disputes that would follow his death, and with what slaughters, and what quantities of gore, she would perform his obsequies.” At last he ordered his body to be buried in the temple of Jupiter Ammon. When his friends saw him dying, they asked him “whom he would appoint as the successor to his throne?” He replied, “The most worthy.”… On the sixth day from the commencement of his illness, being unable to speak, he took his ring from his finger, and gave it to Perdiccas, an act which tranquillized the growing dissension among his friends; for though Perdiccas was not expressly named his successor, he seemed intended to be so in Alexander’s judgment. The words that Jim Minto ‘ascribed to Alexander’, though equally inaccurate, at least sound like something Alexander would say. I suspect, though, he was conflating his reading of Alexander with his watching of Gladiator. Either way, I hope he enjoys a long and happy retirement. Thank you for this interesting tour across different internet articles that refer to Alexander. Sadly, in most times the facts are misrepresented, and this happens not only in respect to Alexander but many other historical and even fictional figures. I guess the journalists wish to be appear wordily educated but fail in the main skill they suppose to possess – doing a proper research. Let me share with you 2 of my favorites. One about Alexander, from some food guru who advertised the famous lecho recipe citing that this particular recipe goes back to the times of Alexander and was one of his favorite dishes. Sadly for the author’s credibility the main ingredient of lecho is sweet red pepper; he should have mentioned Columbus instead! Not as old but at least credible…. somewhat. Thank you – I’m glad you liked it. I could not have written this post (or any of the others like it) without Google Alerts. It would be nice, though, if journalist/columnists did their research as people are going to believe what they say. At least it gives me something to write about and an excuse to open up my books again! I liked your two examples, especially the one about the journalist, politician and poor Cassandra!